Vietnam's new gold bridge is a breathtaking site for tourist.the bridge offer amazing views of Hills. The bridge was designed by TA Landscape Architecture based in Ho Chi Minh City. Vu Viet Anh, is the main designer. 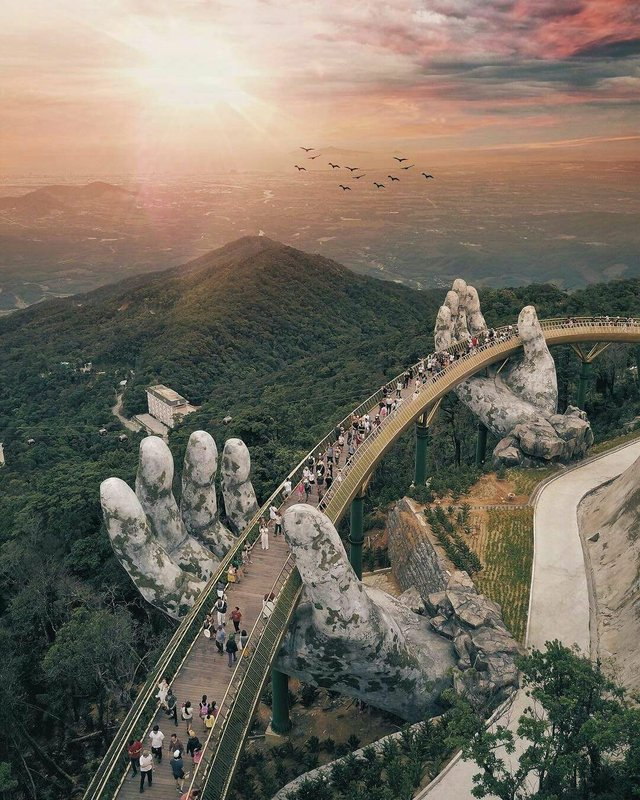 The Golden Bridge is situated in the Ba Na hills,near Da nang,Vietnam. It is 150 metre High. sits 3,200 feet above sea level,according to Reuters. It is created to connect the Cable car station with the beautiful gardens and to provide a scenic overlook and tourist attraction. The bridge has two giant stone hands designed to appear to support the structure. The bridge opened in June 2018. The place is grabing attraction for many reasons.such as it's beautiful scenery, amazing weather and it's constructions. What makes the bridge attractive for tourists and locals is its unusual support system ― two giant concrete hands reaching toward the sky. Your post has been selected to be presented in Steemit Bangladesh Curation Competition Episode # 15 . If you are from Bangladesh and would like to present the article in the voice hangout during the competition, Please join the hangout on our Discord server.